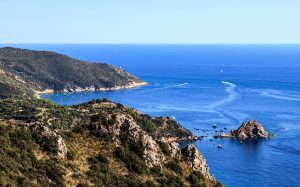 Monte Argentario is a promontory stretching into the Tyrrhenian Sea. It was an island in the past, but the sea currents and the Albegna river have joined it to the mainland through two tomboli (stretches of sandy terrain). The highest peak of Monte Argentario is the Punta Telegrafo (635 m). 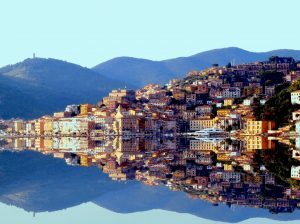 The main town is the fishing village of Porto Santo Stefano. The other township on Monte Argentario is Porto Ercole. 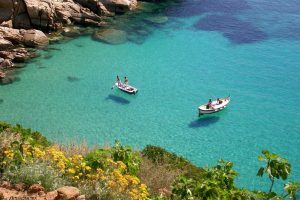 Located on the northwestern promontory of Monte Argentario, a little more than 40 kilometres southeast of Grosseto, about 10 km southwest of Orbetello and about 12 km from Porto Ercole. More about Porto Santo Stefano. Porto Ercole is located very close to Porto San Stefano but is much more of a tourist centre, with a lively night life and numerous restaurants and fashion outlets, as well as a harbour full of luxury yachts. In 1610, Caravaggio died here while awaiting a pardon for murder from the Papal court. 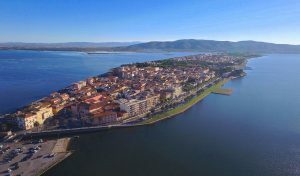 Orbetello is located on a narrow strip of land in the Orbitello lagoon. It was an ancient Etruscan settlement, which in 280 BC passed under the control of the Romans. The Cathedral of Santa Maria Assunta is built over an Etruscan-Roman temple and was rebuilt in 1375 in Tuscan-Gothic style. This island is separated by a 16-kilometre of sea from the promontory of Monte Argentario. Isola del Giglio is mainly mountainous, consisting almost entirely of granite and culminating in the peak of Poggio della Pagana (496 m). Isola del Giglio is covered by Meditarranean vegetation,with large pine forests alternating with numerous vineyards that produce the local “Ansonaco” wine. More about Isola del Giglio. The Rocca Aldobrandesca is located above Porto Ercole and was originally built for the Abbazia delle Tre Fontane and passed to the Aldobrandeschi family in the 13 C. They expanded it into imposing fort in the shape of an uneven star surrounded by a thick stone wall with four bastions in each corner, one of which was transformed into a lighthouse in 1862. 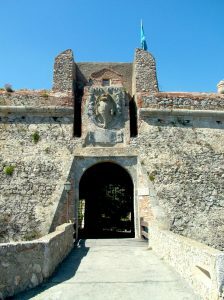 More about the Rocca Aldobrandesca. The Tower of Argentaria is of mediaeval origin and was rebuilt by the Siennese in 1442. 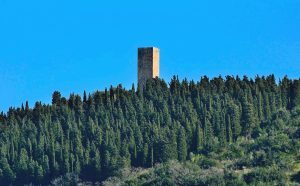 It is the only tower on Monte Argentaria that is not very close to the coast. It has a square base and the entrance door was on the north side, accessed through a now lost external staircase, very likely protected by a drawbridge. The portal has an architrave of rectangular shape, culminating in a fine round mediaeval arch. More about the Torre dell’Argentiera. The Forte Stella is one of a number of forts and watch towers built or renovated by the Spaniards when they controlled Monte Argentario. It consists of a star-shaped keep and a second outer wall. 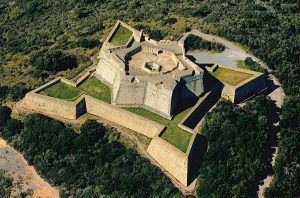 The fort is one of the principal sights near Porto Ercole and a must visit for anyone who enjoys military architecture or specacular views. More about the Forte Stella. Information for visitors to the charming coastal area of Monte Argentario, famous for its fishing villages and spectacular sea views.